Look at that glorious mess up there. “That’s not chess,” you say. Damn right, it’s chess on drugs. Get this game another hit of the good stuff, because it’s clearly working. Chesh gives one of the world’s oldest board games 271 pulls off a bong, takes it out back through an alley, explodes it up into little pieces, stitches those chunks back together, spins it around 31 times and tells it to get back to work first thing tomorrow morning. You can recognize the basics—it’s still turn-based movement on a grid with the aim of capturing enemy pieces—but, otherwise, your old extracurricular activities friend from high school looks and feels way different. Damian Sommer’s radical reworking replicates the buzz of when chess first clicked in your head. And it does that same trick over and over again with each new game. 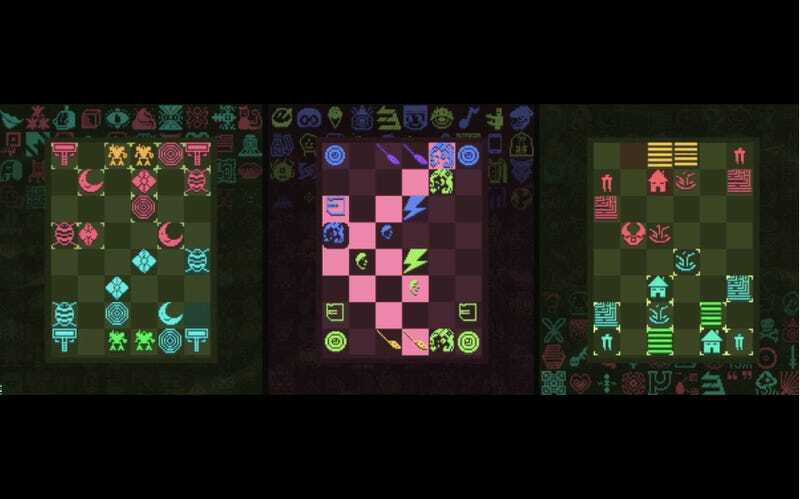 Pieces are rendered as a slate of undecipherable glyphs and you get new ones every time you play. There are 533 pieces total and each one comes with its own unique movement properties, a feature which forces you to use new mental muscles every time you play. You can see the game in action in the video above; I’m controlling the pieces at the bottom of the screen. Since the range of each piece is only shown when you select them, Chesh is simultaneously transparent and opaque. But you’re locked into using a piece once you touch it—because knowing what it does and then deciding to use another option would break the crucial tension that makes the game so fun. Tap on a faux-bishop to see where you can place him and you need to commit to one of those spots. Sometimes, you’re forced to destroy your own pieces to gain that knowledge. Other factors—like pieces exploding after a certain number of turns and the timer ticking down in the Bullet or Blitz Chesh versions—complicate your strategy, too. There’s a memory game wrapped in here, too; your chances of winning are better if you can remember the movement rules of the pieces you’ve already used. The rhythms of Chesh feel more rowdier and more impatient when compared to its sober cousin. The goal isn’t to set up an “oh, aren’t I so clever” checkmate. Instead, all you need to do to win is knock off all of the chunks of your opponent’s life bar. I’ve only played against the computer AI so far but I found myself better able to feint and set up traps after a few hours with the game. I’ve always sucked at chess. I know the rules of movement but the psychological strategy aspect of playing it have always jammed me up. But I can’t stop playing Chesh, probably because it takes away all that daunting, ponderous slowness and replaces it with a brutally aggressive doppelganger. It’s not as insane as Bennett Foddy’s Speed Chess but shares the similar vein of energy found in deconstructing a game that billions of people have played for centuries. You can get Chesh for iOS platforms here.